Have you ever wished, as you were Euro-trucking your way to Manchester with crates of yoghurt in the back, that everything—literally everything—was massive? The cab, the motorway, the island on which you've found yourself? American Truck Simulator will make that wish come true on February 3. At release it will have "a couple of trucks" and the state of California, which I'm told is the most American one, but I'll have to see how much the US team shout at me before confirming. 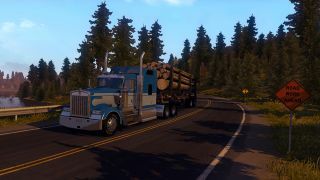 From then on, developer SCS will be pursuing the licenses to bring the most famous big rigs to the virtual highways of America.